The ‘powerful earthquake struck a border area of southeast Iran on Tuesday killing at least 35 people in neighbouring Pakistan, destroying hundreds of houses and shaking buildings as far away as India and Gulf Arab states.’ I was in Dubai at that time, I still am, and according the National Centre of Meteorology here, the impact of the earthquake, measured between 4 and 5 on the Richter scale, was felt all over the United Arab Emirates. “About an hour or so ago, for the first time in my life, I experienced earthquake tremors – a spillage of the Iranian earthquake; the magnitude was immense especially in the Sharjah area. The hotel (Flora Creek Apartment, Dubai), in which my family and I are staying, suddenly turned into a mighty swing, turning from one side to another – everything was virtually swinging. We all rushed to the reception; there was nothing anybody could but wait in horror until Allah accomplished His purpose! 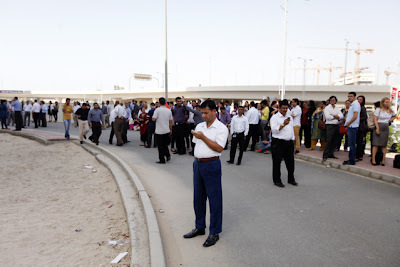 ‘Police in Abu Dhabi, Dubai and Fujairah confirmed there were no injuries, crashes or damage as a result of the quake, but hundreds of people were evacuated from buildings. Many began fleeing while the ground was still shaking, using elevators instead of stairs and crowding outside. Some panicked and ran to exits, screaming.’ Before I could collect myself and locate the shortest and safest way to the reception desk, my family was already there. What! Is it Yaumul Qiyaamah already, when children will flee from their parents? Experts said ‘if there is an earthquake, it is advised you drop to the ground and take cover under strong furniture, such as a table. Hold on, cover your head and neck and wait until the shaking has stopped before you exit the building. Moving during a quake increases your risk of injury.’ It is easier said than done. Hardly will people remember anything at the time of emergencies, though workers here take regular drills on how to conduct themselves during such happenings. The experts further advised that people should ‘calmly evacuate using the staircase and go to an open area away from buildings and power lines.’ But is there much place in Dubai, for instance, where one can stay away from buildings, with all these ubiquitous skyscrapers? What would happen were the earth to cave in beneath these tall buildings and their zenith hurl on pedestrians? Where Muslims accept the above explanation as to how earthquakes occur, they further search for why Allah will cause this to happen? Is it a way of showing Allah’s Signs in the universe until it becomes manifest to all that His message is the truth (Fussilat 41:53)? Are we being warned by these earthquakes (al-Israa’ 17:59)? Earthquakes and their tremors should make us revert to Allah, eschew what He prohibited and strive to attain His pleasure in the world and the Hereafter; in the hope that He may make us whole, and avert from us all evils (al-Israa’ 7:96).